Clubland (Director: Eric Geringas): In the heart of Toronto’s entertainment district you’ll find 60 night clubs and 25 bars packed into 1.5 square kilometres. On the weekends, this part of the city becomes “Clubland.” Over 50,000 people crowd the streets and line up to get into some of North America’s hottest clubs. Eric Geringas’ film takes us behind the scenes and into the VIP lounges where clubbers and promoters let loose. The clubs open at 10:00 PM and close at 2:00 AM. With only 4 hours to serve alcohol, it’s a race to make money and serve as many drinks as possible. When 2:00 AM rolls around, the clubbers pour out into the streets where the noise and congestion wake the neighbours. Fueled with liquid courage, young men routinely engage in fist fights. While the police are busy making arrests, club revelers are passing out on the sidewalk. The film sets up local residents, politicians and police against the club owners, who feel they have a right to be there. The clubs provide tax dollars to the city and they were there before the condos went up. The local residents complain about the noise and the violence. For many, Clubland will provide an interesting glimpse into Toronto’s club scene and the controversy that surrounds it. The voiceover narration is a bit distracting and makes the film sound like a really bad beer commercial at times. Aside from that the film is well-produced and presents arguments from each side fairly. The economic contribution from the condos far outweighs the tax dollars that the clubs can generate. 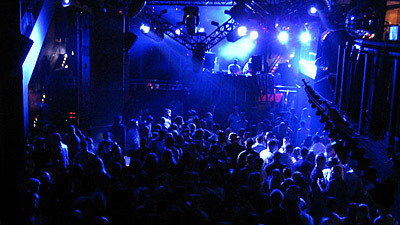 The film concludes that political pressure is forcing an increasing number of night clubs to close while the construction of more condos is transforming the neighbourhood. If you missed Clubland at the 2009 Hot Docs Canadian International Documentary Festival then you can see it in Canada on Global Television on Friday, October 2 at 8:00 PM ET/PT. In Winnipeg and Regina, the documentary film will air at 7:00 PM. This entry was posted in Documentaries, Television and tagged toronto. Bookmark the permalink.